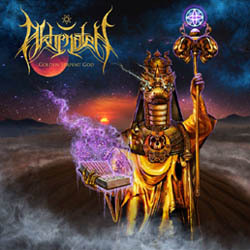 Mesopotamian blackened death metallers Akhenaten from Manitou Springs, Colorado, USA are excited to unveil the first details of their new album, entitled “Golden Serpent God“. It is the second full-length album of the band, after 2015′s “Incantations Through the Gates of Irkalla“, an album that got very positive feedback. Akhenaten is the personal project of brothers Jerred and S. Wyatt Houseman, who were both members of Execration (brutal death metal) and are also currently together in Helleborus (symphonic black metal). They have just unveiled the amazing cover artwork of ”Golden Serpent God” by Tony Koehl, as well as the album tracklist. Akhenaten will soon announce the release date and more details, as well as the first single!